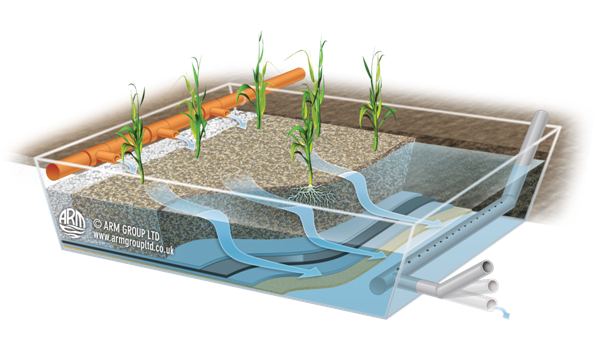 The Horizontal flow Reed Bed is the most commonly used reed bed system in the UK. It provides continuous treatment with minimal mechanisation. Horizontal Flow(HF) reed beds consist of an excavation approximately 0.6 metre deep which is lined to ensure untreated effluent cannot percolate down into the groundwater. The bulk of the excavation is filled with single sized media such as gravel with larger media at the inlet and outlet. A piped inlet distribution and drainage system is installed and reeds are planted directly into the gravel media. The effluent to be treated passes through the gravel media and the level of the effluent is controlled by means of an adjustable level control pipe in an external discharge chamber. They are described as horizontal as the effluent enters one side of the bed and moves in a continuous process across the bed where treatment is effected by micro organisms before being collected and discharged on the far side of the bed. HF systems can be operated in sub surface flow, and surface flow (otherwise known as Free Water Surface FWS) modes.